Russian Peak is a P2K in the Salmon Mountains, the highest point in the Russian Wilderness. You'd think it might make the Western States or CC list, but it fails to rank on either. The peak makes for a fairly short climb from the south starting at the Bingham Lake TH, about 2mi one-way. I didn't know ahead of time if I'd be able to drive the 7mi of dirt forest road to the TH, but was happy to manage it in the van. Driving in the afternoon before, I found the first four miles somewhat rough and slow (rocks in road, some ruts), the second two miles smooth gravel (where did this come from! ), and the last mile rough and dicey in at least three places. Later I found only the last mile was in the driving directions Mike White gives in his book, Trinity Alps & Vicinity. It's possible his route is in better condition, but one still needs to navigate (or walk) that last mile. I spent the night camped at a fork in the road that I thought was the TH, but it turns out I stopped 1/3mi short. Because the sun does not come up until 7a this time of year, I didn't get up until 6:15a and get started until shortly before 7a. The first mile of trail is an old roadbed that makes a level traverse across the hillside to the west with occasional views south down to Jackson Lake. Where the road ends, the trail begins climbing steeply to the northwest, up 250ft before dropping 400ft (even more steeply) down the other side of a saddle to Bingham Lake. A use trail continues around the east and north sides of the lake. Mike White describes the hike to the lake as costing "a gallon of your sweat", going on to describe the climb to Russian Peak only for those with "unlimited energy". I don't think he was much of a peakbagger. From the lake, one climbs steeply for 1,000ft up the south slope of Russian Peak, cross-country but with no real brush to contend with, the craggy summit rocks going at easy class 3. It was 8:10a when I topped out, only an hour and a quarter from the van. It's a great perch to take in far-ranging views, deep into the Trinity Alps to the south, northwest to the Marble Mtns, and east to Mt. Shasta rising as the monarch of the entire area. There were two booklets in the nested cans found here, both filled with many, many entries, too many to photograph, and yet dating back less than ten years. SummitPost describes this as a half day adventure, but that would only be true if you include the drive both ways in a low clearance vehicle. I knew it would be an easy outing, but I was surprised just how short it was. I had bonus peaks in mind to fill up the day, so no worries there. Grizzly and Wildcat Peaks are found on an adjoining ridgeline to the southeast, the former looking the more interesting of the two with a granite summit dome. These would occupy me for a few additional hours, but not really enough to fill the day. The longer option I had looked at the night before was to reach an unnamed P1K more than 4 air miles to the NNW. Normally this would be much too far to consider over the typical terrain in this part of the state, but the PCT runs north through the mountains here and offers a superhighway of hiking to span the gap between the two. 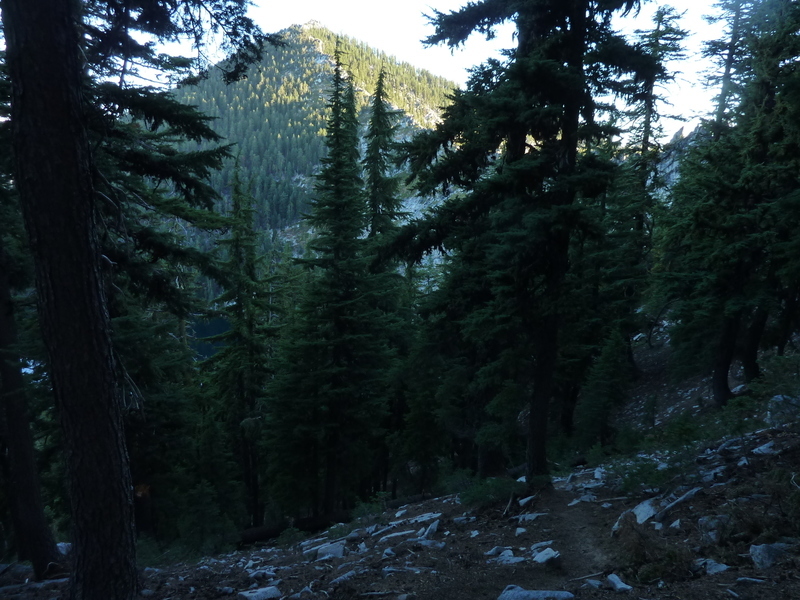 The only trick is that the PCT runs on the west side of the crest, several hundred feet below Bingham Lake with no connecting trail that I could discern from my short research. Looking west into the South Russian Creek drainage, I decided the descent seemed reasonable, albeit steep. As long as I didn't run into cliffs, I should be able to drop directly to the PCT from the summit without bothering to first go back to Bingham Lake. It was a bit of a gamble, but down I went. Heading roughly northwest off the summit, I dropped 1,500ft in about 40min, having a ball in the process. Under cover of forest for much of the descent, I scrambled down granite rocks, slid on pine needle ground cover and avoided heavy brush until the very end when my route fell into a drainage thick with alder and other brush. Luckily this stuff is easy to descend (a b**** to ascend) by grabbing onto branches and stepping over and through the thick of it. Once I landed on the PCT I put away my gloves and my worries and strolled off in a northerly direction. The PCT traverse across the west slopes of the canyon, offering views across the drainage to more high, unnamed summits. Much of the 1.5hrs I spent on the trail travels through forest burned two years ago in the July Complex Fire. Most of the trees died in the fight, but some survived, evidenced by the green branches found high in the canopy. On the ground, brush that was burned to the roots was making a comeback. After the trail goes over a saddle on a subsidiary ridge, it enters the Music Creek drainage. The P1K I was after was on the north side of this drainage, it first being necessary to continue around the drainage on the trail until it goes over a saddle on the crest SE of the summit. Since entering this second drainage, I could hear the sounds of diesel engines and saws downslope to the west. Once I could see them, it was clear they were doing salvage cutting in the burned areas below. There are actually two summits separated by half a mile with spot elevations of 7,933ft shown on the topo map. As such, it was unclear which was the highest and therefore the P1K, the only solution of course, to climb both. Having a drop of more than 300ft between them would make this more challenging. I left the PCT just before it goes over to the east side of the crest, heading cross-country to the northwest and angling up to the closer east summit, only 2/3mi away. The slopes here were a mix of burned forest and open, mild brush, some of which had evaded the flames. It was easier than I had expected, and as I continued I found myself doing more traversing than climbing. I decided that the mid-level slopes here were a good, open route to the west summit and I changed targets to climb the further west summit first. I was happy to find that it took only 40min to reach the west summit from the PCT, including a fun class 3 scramble for the final 100ft up the summit rocks. It was 11:10a when I reached the top of the west summit, finding no register or cairn. Big Blue Lake lies in a cirque between the two peaks on the north side, a picturesque sight from my lofty perch. I snapped a few photos in other directions before dropping down an alternate class 3 route off the south side of the summit and turning left to follow the ridge. There was some fun scrambling between the two, more burnt forest as well, a few deer to spook off, and after only 30min I found my way to the east peak. No register on this summit either, but it had a 4th order benchmark labled "PAYNE" (Paynes Lake is found in another cirque northeast of the summit). Only the final 10ft of the summit qualifies as class 3. A large turkey vulture had been perched at the top watching my approach, eventually flying off when I got too near. He circled around the area for the short time I was there, probably returning soon after I left. The Russian Peak area is host to an exceptional diverse number of conifers. In 1 square mile adjacent to (Little) Duck Lake there are supposedly 17 different ones. Hopefully the fire you depicted in your photos spared some of these, which seem to be 'mostly' on the east side of the crest where you were. Some of the more unusual ones (for this area) include Brewers Spruce, Englemanns Spruce, Subalpine Fir and Foxtail Pine. More details and further references can be found in "Conifer Country" by Michael Edward Kauffmann. Have always wanted to visit this region, so "Thanks" for the primer ! Found on the east side of the crest, Little and Big Duck Lakes were spared. The fire was on the west side of the crest in the Music and Russian Creek drainages (and places further west).